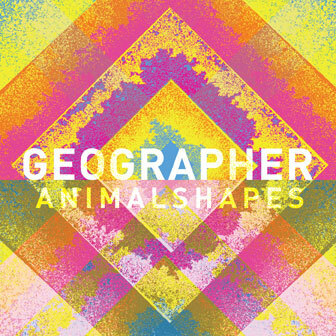 Geographer’s new EP, Animal Shapes, is a pop rock album with a mixture of synthetic and natural elements. The band consists of three members: Michael Deni (guitar, synth, vocals), Nathan Blaz (cello), and Brian Ostreicher (drums). Geographer often mixes an organic cello and airy vocals with synthetic beats, creating an interesting contrast. The melodies are simple and straight-forward, which can work for or against the songs. “Original Sin” is the most dance-heavy song on the album, while “Kites” sounds like a Nintendo game mixed with dirt and a crunch of an MGMT beat. Deni’s vocals are spot-on here, adding an airy touch to the roughness in the beat. “Heaven Waits” is one of the more organic songs on the EP, focusing more on guitar, drums, and cello, abandoning most of the synth. Nothing on Animal Shapes fails and a lot of the songs are light and enjoyable, but there’s not much to wow you, either. Having a more synth-based album should give the listener a chance to hear something fresh and inventive, and in this regard, Geographer plays it too safe.